On arrival, the clients will be met by a George Steuart chauffeur guide and transferred to The Steuart by Citrus. The Steuart by Citrus - The long-standing “Steuart House”, which stances in the Heart of Colombo is a colonial edifice with a history of over 180 years. This was the house for the headquarters of George Steuart & Co. Ltd, the country’s oldest commercial establishment until it was transformed into a boutique business hotel in July 2015 and suitably named as The Steuart by Citrus. This sky-high 8-floor Colombo city hotel claims ownership for 50 spacious, elegant and stylish guest rooms, with comforts to make your stay more than just pleasurable. The Steuart by Citrus located in the core of Colombo, is a Boutique hotel planned to offer the convenience of a prime location just 1.5 to 2 hours away from the Bandaranaike International Airport of Sri Lanka. This city hotel in Colombo is nestled amid iconic landmarks such as the Dutch Hospital complex, Galle Face Green, the Colombo Harbour and the lively city streets of Pettah. Being in Colombo’s renown also means easy access to tourist spots in the city without a hassle as you are recovering yourself from the jetlag. Colombo: The throbbing metropolis, Colombo - located in the West - is not only the country's commercial capital, but also the turbine that impels above 50% of the national GDP flanking Colombo's fancy urban development effort. Drive along the clean streets edging the crystal white Race Course - horse racing hub in 1893 & World War II airstrip - furnished today with lavish clothing, food & tea boutiques. Meanwhile, ride to Pettah & tune into the Floating Market - an offbeat shopping experience - or feel the buzz surrounding the upcoming inspiration, the Colombo Port City - an offshore city - featuring parks, commercial complexes & even an F1 track! Head along Bauddhaloka Mawatha towards 'Arcade' facing a historic waypost, the Independence Square. Every designer boutique, top-notch cuisine outlet and even the 'walk-over fish tank', have revamped this colonial masterpiece into one of the trendiest shopping and hangout zones in Sri Lanka. Have a chilled beer at the Dutch Hospital while gazing through fancy windows showcasing best fashion, jewelry & handicraft brands. Smell the scent of incense while listening to the chiming bells of Gangarama temple. Or, jazz up to Colombo's night life spiced by night clubs & casinos that borderline its bustle. If you're lucky, head into an exhibition at the Bandaranaike Memorial International Conference Hall (BMICH) before swaying your head to an opera or play at Nelum Pokuna that should just drive your day into perfection! Optional – Enjoy a Tea Tasting session at George Steuart Tea House. Transfer to Kandy after breakfast. Visit a spice garden en-route to see spices growing in their natural habitat and learn about spices and their use in Sri Lankan cuisine. En-route visit the Pinnawela Elephant Orphanage in time to witness the bathing and bottle feeding of elephants which have been abandoned by their herds in the wild. The Botanical Gardens is 147 acres in extent, stated in 1374 as a pleasure garden of the Kings of Kandy. There are more than 5000 species of tree and plants as well as some rare and endemic flora from the tropical world. Spice Garden and Orchid House are popular with tourists. This is haven not only fir Scientists but to every nature lover as well. Afternoon will be spent sightseeing Kandy including Arts & Crafts workshop, Oriental Market Place, Bazaar and Gem Lapidary. 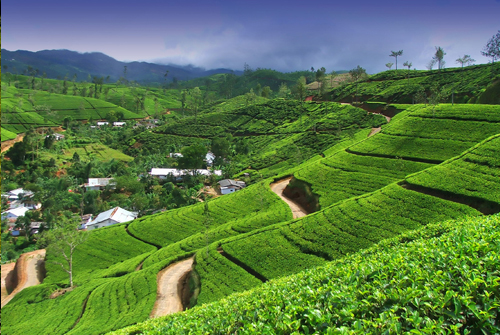 Optional – Visit a tea plantation to see how tea is plucked and a factory to witness the processing of the raw green leaf to the final graded product. Transfer to the Bandaranaike International Airport in time to meet departure flight.